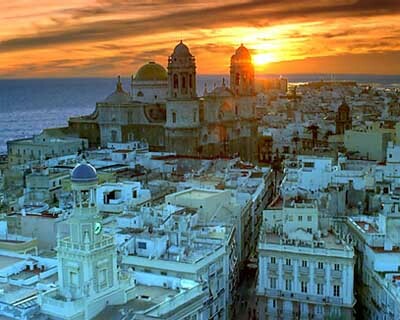 Cadiz is the southernmost province of the Iberian Peninsula, surrounded by the Atlantic Ocean. The town of Cadiz is possibly the oldest city in Western Europe today and best known for his long and influential history. The city of Cadiz itself is connected to the mainland by a tiny union and 66.91% of the land between marshes (belonging to the Natural Park of the Bay of Cadiz) and beaches is not developable. The nearest international airport is Jerez de la Frontera. It is situated 35 km from Cadiz by motorway and about 30 minutes by car. The next closest airport is Seville airport San Pablo, 120 km on the highway and about 70 minutes by car. This airport receives direct flights from Barcelona, Bilbao, Fuerteventura, Gran Canaria, Lanzarote, Madrid, Santiago de Compostela, Tenerife and Valencia. From Seville to Cadiz there is a good train service connecting the two cities; the trip takes one hour. The Spanish railway RENFE has regular connections with all major cities like Seville, Madrid, Barcelona etc. Cádiz station is the main railway station of the city. Here are departing suburban trains to Jerez de la Frontera, middle distance trains to Seville, Cordoba and Jaen and long-distance trains to towards Avila, Madrid and Barcelona. Coming from Algeciras, take the N-340 passing by Tarifa, Barbate, Vejer, Conil and Chiclana. Coming from Sevilla take the motorway A-4 which will take you in almost less than an hour to Cadiz. Main distances to other cities: Seville 125 km, Algeciras 127 km, Gibraltar 138 km, Malaga 250 km and Madrid 660 km. This option allows you to travel to the Canary Islands or to the port of Genoa City. For those who prefer short trips: In El Puerto de Santa Maria lies the mythical "Vaporcito" with several daily departures from El Puerto de Santa Maria to Cadiz city center and viceversa. The commercial port is located in the historical centre of Cadiz, with a constant influx of cruise ships. The Port of the Bay of Cadiz has become in recent years a major staging point for cruises and ocean liners and also connects the Peninsula with the Canary Islands and Tangier by sea. You can travel from Malaga and the main resorts along the Costa del Sol to Cadiz with direct bus from Malaga bus station (www.ctsa-portillo.com ) which takes about 4 hours. The inconvenience is that these busses are running just three times a day. Malaga to Cadiz by car driving tips: It is about a 3 hours drive along the motorways A-381 and A-7. Alternatively to the A-7 (Autopista del Mediterráneo) you can use the toll highway AP-7 which runs parallel to the A-7 and is especially in summer less congested with cars. As Cadiz is not a large city, you will find a great amount of monuments, museums and charming corners just in walking distance. There is as well a comfortable Touristic bus touring the most outstanding monuments. From Cadiz leave catamarans which link the city with the municipalities of Puerto de Santa Maria and Rota. A means of transport of cultural interest declared by the Junta de Andalucia is the Vaporcito which crosses the Bay and connects the docks of El Puerto de Santa Maria and Cadiz. Cadiz is a port city with avenues, squares and streets as charming as its people and gardens. It is a pleasure to take a stroll and socialize with some locals which are pleased to give you any needed information with their best smile. The major districts and streets are: In the historic centre you will find the monuments from the 18th century and institutions like the Archaeological Museum, the School of Arts and Crafts, Royal Academy of Arts, the Genoves Park and the Gran Teatro Falla, along with many little shops and a marine ambience. The Barrio del Populo is the old medieval town, built between the 13th and the 15th century. Here are situated the Roman Theater, the Arch of the Whites, the old Cathedral and the church of Santiago. The barrio de la Viña is a popular and typical district where currently take place the Carnivals of Cadiz. Here you can find many Tapas Bars and restaurants where to enjoy some good fish and a drink. Cadiz is a very pleasant province for summer. Many families looking for less bustling and crowded beaches than the ones of the Costa del Sol are choosing this location. The municipality has a good infrastructure of hotels and restaurants. The beaches are beautiful, very wide and wild, with dunes and dune vegetation, which gives it a different air from the Mediterranean beaches. Its low tides leave small pits in the sand, where children can splash and parents can rest a little, without danger of drowning. From Cadiz can be highlighted many things as its beaches and festivals. Ideally, however, is getting lost in a summer night having Tapas in the Barrio de La Viña or the Barrio del Populo. There is also its rich history, as Cadiz is considered the oldest living city in the West, with a rich artistic and monumental heritage. In the province of Cadiz, there are 22 Golf courses: In general, all are very good and some have magnificent facilities, as in the case of Valderrama in Sotogrande or Montecastillo in Jerez de la Frontera, where major tournaments are played, such as the Ryder Cup. In the mountains can be practiced mountain and adventure sports such as gliding, bungee jumping, caving, mountain biking and horseback riding. Shopping in Cadiz: Typical foodstuffs of Cadiz are wines, sausages, cheeses, oils and vinegars. The major food markets are the Central Market, La Merced and San Jose. With regard to handicrafts each municipality has its own specialties: Leather goods (Ubrique and Prado del Rey), blankets and ponchos (Grazalema), boots (Alcala de los Gazules and Espera), articles to guard the horses and winemakers articles (Jerez), objects made of wicker and cane (Medina Sidonia, Setenil, Bornos and Vejer), baskets and sandals (Torre Alhaquime), guitars and bagpipes (Algodonales), handmade ceramics (Arcos de la Frontera and Conil), furniture, woodwork and mahogany furniture (Prado del Rey, Sanlucar de Barrameda and Benamahona). Events in Cadiz: Outstanding events are the Carnival in Cadiz in February, the Festival of Jerez in March and the Easter Week (Semana Santa). Route of the White villages: This classic route through the mountains is one of the most spectacular routes in Andalusia. The white villages owe their name to the custom of the inhabitants of putting frequently lime on the facades of the houses. They are characterized by narrow streets and red roofs and in some of them can be found remains of a castle. It is a route to mainly enjoy the scenery of the mountains of Cadiz and the typical beautiful villages. There are plenty of opportunities to explore the white villages and you can choose from short excursions to tours that last for several days. The most outstanding places are the Natural Parks, Arcos de la Frontera, Grazalema and Ronda. You can combine the trip with visits to the cities of Cadiz, Seville and Malaga or your holidays in the eastern shores of the Costa de la Luz or the Costa del Sol. A trip to the natural park El Torcal near Antequera or to the Rock of Gibraltar completes the tour. Atlantic Route – Costa de la Luz: As its name suggests, this route passes through the villages on the Atlantic coast. Along this path we find the following municipalities: Tarifa, Bolonia, Zahara de los Atunes, Barbate, Vejer, Conil and Chiclana. The Costa de la Luz (Coast of Light) owes its name to the vivid light that highlights the comeliness of its streets, the whitewash of its walls, the golden dunes and the reflection of the silver sea, the only greyish tint in this land of color. In addition to excellent beaches and beautiful towns of the northwest coast and the bay of Cadiz, on the south coast is a vast semi-wilderness of white sandy beaches dotted with fishing villages of extraordinary beauty. Wine Route of Jerez: This route unites the three cities of Sanlucar de Barrameda, El Puerto de Santa Maria and Jerez de la Frontera. On this trip you can enjoy a visit to the National Park Doñana and take a boat tour on the river Guadalquivir. In Jerez de la Frontera is situated the Royal Spanish School of Equestrian Art, with outstanding exhibitions. There is a lot of tradition with the art of horsemanship and there are many riding schools throughout the province. In Cadiz from Sanlucar de Barrameda, and along 260 km coastline, you can find the finest beaches and golden sands of the peninsula.The importance of Cadiz and its regions during the period of Roman civilization is still perceptible in the myriad archaeological remains.